I wanted a unique handprint of each of my kids. I had seen it done before where they just stitch a traced handprint on plain muslin. It was very cute, but I wanted a little something different. So this is what I came up with. Hope you like it and you can find inspiration for some of your own. Set aside the largest piece of fabric. This will be what you stitch the hand and name to. Grab your adorable child and trace their hand onto a piece of paper. Cut out. 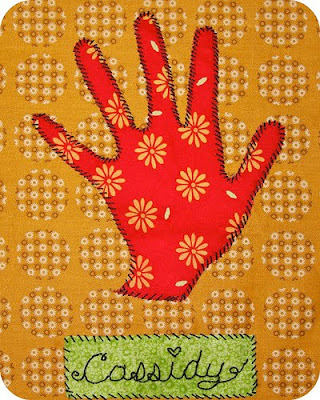 Use the paper pattern you just made and cut out a fabric hand. Next, use Spray adhesive on the back and place onto your large fabric piece. You could also pin it if you don't want to use the adhesive spray. Take your needle and thread and begin stitching around the whole hand. You can use any type of stitch you like. I just kept mine simple. I liked the way it looked with this one. X's would be cute and so would a blanket stitch. Now take your third piece of fabric. I cut mine in a rectangle shape and fit to the length of my daughters name. Yours may be smaller or larger depending on the name. (but you could also leave this part out if you didn't want to add the name) Stitch just below the hand print. I think it would be cute to add their age too! Adding the name.... I used a pencil and wrote out her name in cursive and just stitched over the pencil markings. It would also be cute to have your kids write their own names. If they are old enough. Place in a frame or glue to a canvas board and hang on the wall. Enjoy it for years. These would make great grandparents gifts too! I can see 9 of these in line at my moms house. I know she would love it. If you make any of these or have your own version, I would love to see them and even share your photos in this post. Thanks! we recently did this for mothers day pressies: like the fabric! Love this!! I will be feature this on my blog!! darling idea... might have to steal this for father's day! I LOVE this!!! I mean really LOVE this! I am sharing it at MIdchix and sending you some Link LOve at the same time! This is right up my alley! Linking you at Midchix.com in the Crafty Mamas Flock.....I will add your URL to the blog roll as well..........So fun!